On October 25, 2017, Anabio welcomed a delegation from Peru, including Mr. Cesar Mejia Samillan, Mr. Diego Mejia and Mr. Alexander Maslaga. The customers, despite the far distance, flied over to meet Dr. HoaAnh in person and paid a visit to the factory. 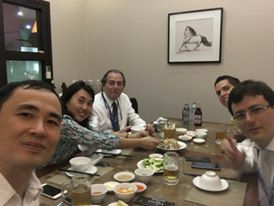 After a detail discussion session, we signed a long-term contract together, and they wished to order all of the company’s liquid probiotics products, including those yet to be launched in Vietnam.